The State Land Information Board was originally created in 1997 by Arkansas Code 15-21-501, and was later renamed the Geographic Information Systems (GIS) Board. 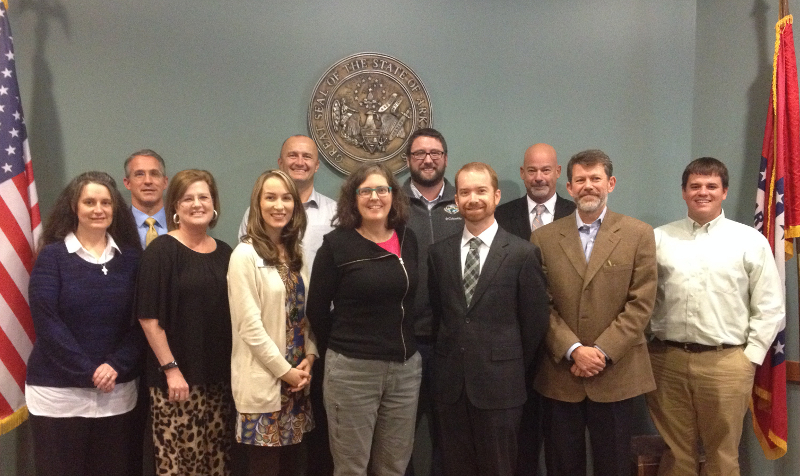 The Arkansas GIS Board oversees the work of the Arkansas GIS Office and, in conjunction with the Arkansas Land Survey Advisory Board, the Division of Land Surveys. The Board’s history traces back to 1997 when the legislature recognized the need for State agencies, cities and counties to work together to coordinate the development of a statewide system of automated geographic information. A main concern at that time was to avoid costly duplication of effort by ensuring that disparate agencies did not create the same data. Since those beginnings the Board has overseen the development of a statewide GIS that includes a warehouse of geographic information system data coordinated across the state. Major data sets include roads, address locations, municipal boundaries, tax parcels, and statewide digital orthoimagery. In 2015 the legislature merged the Arkansas Land Survey Division with the GIS Office and now the two entities work together strengthening the accuracy and quality of statewide survey and map information. The Land Survey Division oversees the archive of public land survey system corners and plats. This includes contracting with Professional Surveyors around the state to restore and remonument original survey corners from the Louisiana Purchase. Board members must have specific knowledge in the surveying and mapping disciplines. The Board recommends statewide strategies for surveying and mapping activities as well as program funding for various projects to enhance the quality of the state’s data.